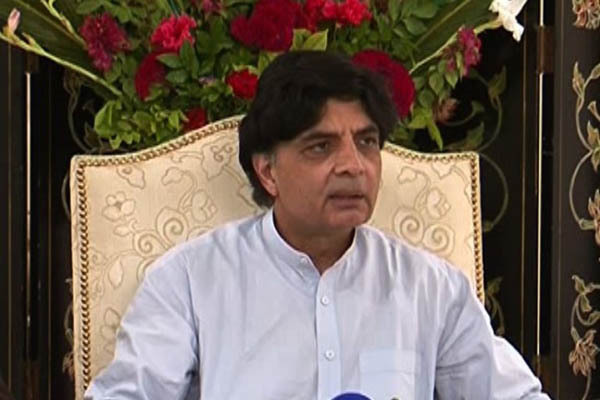 ISLAMABAD, May 30 (APP): Interior Minister Chaudhry Nisar Ali Khan on Monday approved plan submitted by National Database and Registration Authority (NADRA) for re verification of CNICs of 25 million families. The approval was given after a briefing given by the chairman National Database and Registration Authority (NADRA) to the Minister, said a statement issued here on Monday. The emergency re verification of CNICs was launched by NADRA on the directions of the Minister according to the statement. Telecommunication Authority’s bio metric sims verification data of almost 130 million mobile phone sim users. NADRA would send short message service (sms) to the heads of the family requesting them to confirm their family tree (members of family). family member in the family tree then head of the family will send text message back to NADRA with a reply “No”,”the statement said. family tree through sms would request the family head to approach the nearest NADRA office for re verification of family tree. This would help NADRA in identifying an alien in a family and would ultimately lead to blocking of his CNIC besides cancellation of passport if any. NADRA in its strategy paper maintained that late data entry of any family member into a family tree would also help them in identifying alien entry into NADRA’s record. NADRA would also set up a helpline capable of handling 10,000 calls per day and an SMS gateway of 300,000 sms per day to facilitate general public who wanted to report suspected CNICs issued to aliens by NADRA. The Interior Minister Chaudhry Nisar Ali Khan also announced two months amnesty for NADRA employees to voluntarily come forward and declare any false data entries made by them for registration of aliens into NADRA’s database otherwise action would be taken against them. Similarly, the amnesty scheme was also extended to aliens to voluntarily surrender their CNICs obtained from NADRA through illegal means. public who would help NADRA in identifying CNIC issued to aliens, either through sms, calls or personal reporting by individuals in any of its centre across the country. in NADRA headquarters. The details of helpline centre and sms alerts would also be shared by NADRA with the public through mass media. The Minister directed NADRA officials to utilize all resources for achieving this objective of removing aliens from its database.